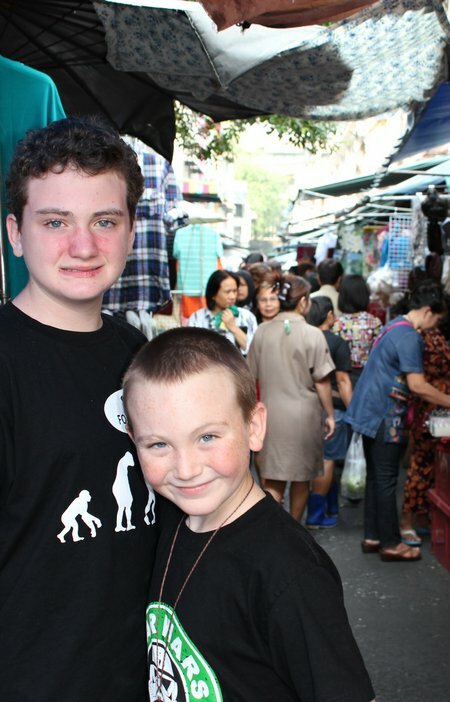 My children loved Thailand and particularly Bangkok. This post is the second of a 2-part series on Bangkok with children. Long walks, in cities and on trails, have become a signature of this trip. Bangkok was no different. 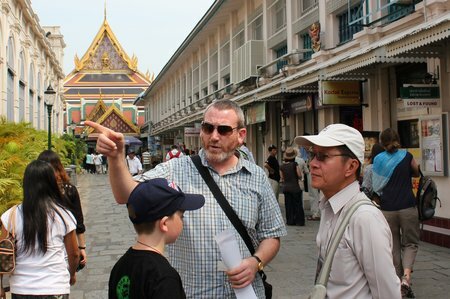 The plan for Day Three was to visit the Grand Palace but leaving our hostel before 10am meant that we had plenty of time to wander our way towards the days’ main sightseeing event. I did not count on the noise and smoke on the Bangkok city streets. We could barely hear each other speak – which wasn’t good since banter is an important part of these family meanders – and I could feel the soot and exhaust fumes clogging up my skin. We took a side street and walked into a bustling local market which stretched for four or five blocks and then turned again into yet another market. We were the only strangers around. The boys haggled for food and munched their way forwards. I bought some organic soap for full price (truly, I was worried about the state of my face after the earlier part of our walk) and CAM lamented that I really shouldn’t be allowed shop in markets with such pitiful haggling skills. As expected, the Grand Palace was crowded. Murph and I needed to borrow some clothes to meet the dress standards (long sarong for me, long pants for him). As we lined up to be outfitted the boys waited and grumbled. “Oh, the pain of it all, to have to go see yet another temple. In this heat. With such crowds. Isn’t life hard sometimes”. That might have been what they were saying. Or else they were deep in conversation about the intricacies of some video game or other. I can walk through a palace, church, ruin or castle reading from my guidebook and learning about the place we’re visiting with the best of them but the Grand Palace in Bangkok seemed to be too big with too much to see for even me to handle. We opted instead to hire a guide and it was 400 Baht very well spent. Over the course of nearly two hours we learned about the palace and temples and also about not just Thai history but the history of the South East Asian peninsula, the internecine wars and rivalries, shared cultures and religious beliefs which make up this fascinating part of the world. 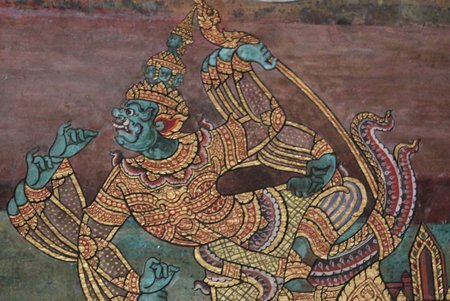 I’d love to say that my boys were as intrigued as Murph and I but they weren’t until we stepped into a colonnade where stories and characters of the Ramayana were gloriously drawn along the walls. In rich golds, blues, greens and firey reds the demons, monsters and monkeys captivated their imaginations. We lingered longer in these corridors than I would imagine is normal but our guide, sensing that he was weaving a magical world that was entirely new to our children, seemed to relish this role as a story-teller rather than a history buff and played along. By the time our tour finished it was pretty clear that we all needed a little downtime after such an intense few hours. Although we were tired, I could not have wished for a more perfect experience in such a unique and beautiful location with my husband and children. This entry was posted in International Escapades, Thailand and tagged Bangkok, Thailand on January 31, 2011 by wandermom.